No Wonko, the name I had in mind was WimComBoom. If u think about it, whether we like it or not, we are missionaries in a sense, namely in the sense that we tell this around, I was talking to my colleagues the other day about reducing windows to 8 to 9 gigs, they frowned when they heard it. then they started asking me questions on how to do it, and I said I could give them the site address, then they went "shall I learn anything", well I said u'll have to do a bit of reading, and they said, then nothing doing, that is the part that I really want to avoid. which goes back to ur voluntary lack of education, well I say, I'll do my bit by telling them about it, then leave it up to them. but this is sensitizing already. when it comes to the fair and ethical, I am not sure I have understood u correctly: do u think it is fair and ethical to make ppl believe they need at least 70gb mass storage for windows only, which would amount to thinking of having to buy a 120gb hdd or ssd when we know that only for windows a 30gb drive would more than suffice? Zagarolo is fairly close to where I am anyway. let me try it and tell u how it went. but when you Select WIM File for APPLY then you can browse to any place on System Drive e.g. in root of that drive. Sure, and a Z was needed anyway in the name for dramatic effect. It is a lost battle, thanks goodness we have the programs by wimb, Steve6375, Akeo (et alia) that help make the stuff with as little need to read/learn as possible. ok I see, I will try applying the ad-hoc "misplaced" wim and let u know. I couldn't agree with u more on the famous acronym, but remember where I started from, an intuition while lurking on linux, namely on some special builds that preload in ram by default. So I thought why can't we have windows do the same. Of course I customized folder location as I could with my little knowledge, and I thought I had to have a core to get from the switching on of the pc to the windows interface, having "all the rest" reside elsewhere. I went on like this for years, until I found out that wimbooting was more advantageous in space- and time-saving. For further analogy, with the mac this time, I have the taskbar on top and winstep nexus buttons at the bottom for better functionality and look. I am a purporter of another lost cause: may microsoft, apple and linux be as one! it did everything but the bcd part. I had to make all the internal (g4d) and external (bootmgr) adjustments in its stead. 'good thing I have become quite conversant with bootice. it worked both as filedisk and as ramdisk in the end, with wim+vhd on the root of the drive. by perusing all our conversation, I think I wanna get my head together on one tenets: I remember u saying that once I have updated wimboot on a usb device (wim+vhd), I have a whole computer of mine to carry anywhere. As far as I can understand, this is true as long as I have the same software on the other machine: if i have wim and vhd containing all the info concerning my machine (let us say, wpsoffice, maxthon (i love this browser), media player classic), and take this usb device to another machine that has none of the above mentioned software anywhere on its mass storage, I will not be able to see and use wpsoffice, maxthon and/or mpc, if I am not mistaken. Or is it not so? It is like windows togo in another form. 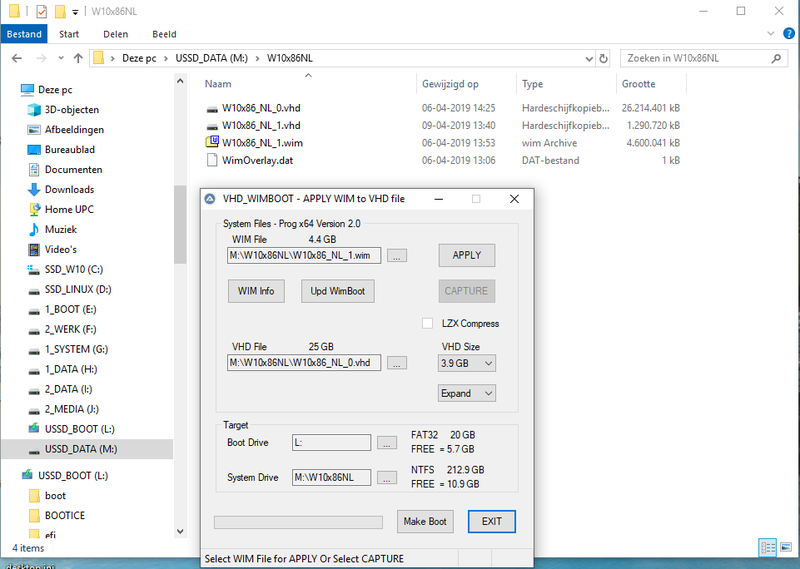 From windows 8 and higher it is possible to start a computer from an usb medium and on first start it will find most drivers for this computer. That is why it is important to boot normally the first time so that the drivers will be in your ramboot the next time you boot. So with taking it to another computer your vhd will grow because of the drivers. Your wimboot file will stay unchanged and because you allready installed all your precious software on it (wimbootfile) you are able to use it on all the computers you boot it on. Another possible sollution is (if you do not want software to be in your wimbootfile) to make a folder on the root of your usb device and put your software as portables in there. They run on your system but they do not touch it and they will not let your vhd grow. Edited by blackbalfur, 2 weeks ago. you cannot imagine how much I hope u r right. Let me tell u that I am a bit confused. If I go to "programs and features" on my machine, I see a list of apps that is no longer than the height of my monitor (so, just a one-page-long list, so to speak). this is the software I could not help but install. As regards the rest, even on other disks, i have a whole lot of programs and apps (portable or not portable) I never needed to install, as they have always worked without a "formal" setup. so I said, fair enough, and went on using them. Now, are all these apps and programs in the charge of wimboot? is the info concerning them contained in the wim even if I did not have a chance even to run them again lately. as u said of portable apps, they give me the impression of running like portable apps, but my vhd has never grown on account of any of them. the only one that has made my vhd visibly grow so far was wpsoffice. if u say that wim will be aware of everything no matter what, how will all these apps on my computer be able to run on other machines if these machines do not have the executables to run them? this is what I fail to understand. what am I missing? as for the portable apps I have just downloaded, may I choose which ones I want and/or add others which are not there? for example, I saw browsers I do not use, may I integrate my favorite into these portable apps instead? The thing that you fail to understand is the step before you capture your wimboot file. if you install software to your vhd like you do on any os it is in the os. 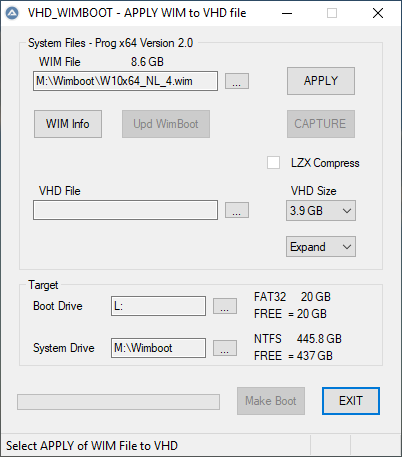 So if you install maxton on your vhd before you capture your wimboot file, maxton will on all the vhd files you make with that wimboot file. So the other computers do not have your apps you need to have your own apps in one or other form. They can be "installed" in your wimboot file or better be in its own folder as portables on the root of your usb device. Portables outside the vhd file will not expand your vhd file. Ps. my name is blackbalfur. I might as well have maxthon portable, as u suggest, but will I be able to enjoy the configuration I have always had (the maxthon5 directory in users\antonino\appdata\roaming\maxthon5)? it contains all the info that is vital to me, passwords and sites. will they be kept even if I use a portable version of maxthon? as for portable apps residing on the usb root, I think I would need a usb device of some terabyte or so. or am I wrong? Yes you will, all will stay inside its own portable folder and most important survive a ramboot because it is outside the vhd folder. So that folder that is normally in your os will now be in the portabe its own folder. Test it and you will see i'm right. What i normally do is making shortcuts to the portables when the vhd is not rambooted but normally booted and then they feel like normall apps. Also from ram when the shortcuts are made in normall booting first. so the shortcuts are under programs in your vhd. as I suspected, when I ran maxthon portable, I noticed there is no trace of my vital config files. As I told u, I do know where they are, how shall I tell maxthon portable to take them into account, viz, what directory should they be placed in in order for the portable version to take them into account? as regards the other portables, it is a nice way of "installing the portable". you should have an "edit" button on your posts. JFYI. it is common use to NOT make a new post when the last post in a thread is your own, but rather edit the last post (yours) adding the whatever you want to communicate, a board is different from - say - Twitter. there must be a folder that has the same kind of information in the portable. Copy the information of your installed maxthon to that same looking folder of the portable and look if it works. I do not know maxthon. u r dead right. I will make sure u will have ur grievance redressed somehow. which I did, the only thing I managed to replicate was my history. all my passwords and favorites have not been transferred, unless I access the sites from the history. e.g., I tried with this site, as it was recent, and did succeed in automatically being recognized. the thing is that I know where the info is, as I said earlier, in appdata etc. so up to now I have always proceeded by placing the info, in my case the guest directory, exactly where the maxthon full version wanted it to be. I never got around to making it via software, only via brute copy. with the full version it works ok, I have not succeeded in making it work with the portable. the stuff as it is, weighs about 2.5gb and I am sure it could be further skimmed. of course these 2.5gb of stuff taxi wimboot for sure, judging from where they reside. so it would be wonderful for me to move them out of the vhd into the maxthon portable. btw. 2.5gb is about the size of my present whole portables directory, which makes it really portable and, as far as i am concerned, it will be fixed as well. this is a new era!!!! ps: what a pity u do not know maxthon. it is solid and it rocks. no dice, blackbalfur, I tried everything I could to get rid of the full version of maxthon in favour of the portable one, which would not keep passwords to vital sites I have to visit everyday, though. It would have been a wonderful 2.8gb save off the vhd, if it had been feasible. Not of any relevance whatsoever, but - hust out of curiosity - what is the actual reason for the 8 character limit in name of directories? I mean good ol' "DOS" filename limitation was 8+3 for files and 11 for directories. The only reason is to have reasonable name size, but indeed 11 chars without spaces for directories is a good idea that will be implemented in next version.